Almost everyone knows what quinoa is these days, especially if you tend to explore nutritional eating at all. I first posted about it way back in 2012. (Wow, how time flies). Quinoa has become a lot more popular since then and is even offered in restaurants now. If you are not familiar with this oddly pronounced seed, (KEEN-whah), I am sure you are not alone. 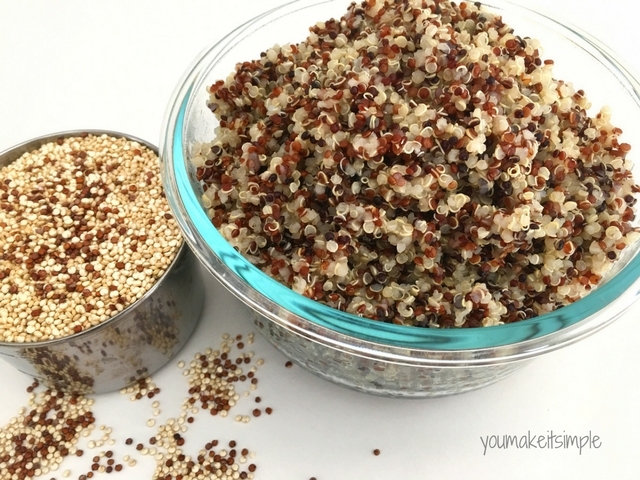 You can find out the BIG scoop on quinoa, here in a previous blog post. The reason I am posting today is that I want to show you how to make it so much easier in the INSTANT POT. I am sure you are not surprised,right? This INSTANT POT just keeps getting more useful everyday. Just keep loving it!!!!! Now, quinoa isn’t that hard to make on the stove top, but it seems every time I would make it, it was different. It’s kinda like making rice for me. I could never get it right on the stove top. But NOW I can have RICE and Quinoa turn out perfect seriously perfect EVERY TIME! 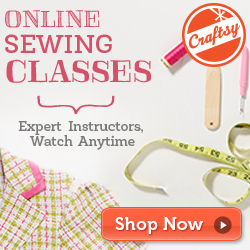 Besides being yummy and easy to make, quinoa ……..
Let’s get right to the …………. 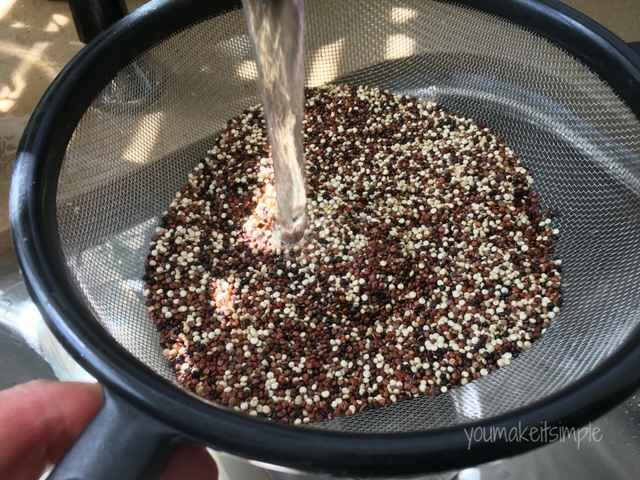 Measuring the amount of quinoa and water is EASY PEASY ! The amounts are equal. ONE part water, ONE part quinoa. Yep, and you know what gets even better, you set the Instant Pot to cook for ONE minute. Rinsing the seeds in a fine mesh strainer will remove the bitter coating called saponin. If you don’t use a fine mesh strainer, the little seeds will fall through. Some quinoa will come pre-rinsed and you won’t have to worry about this step. Place your Instant Pot setting to ‘SAUTE” and add the rinsed seeds to the pot. Saute for 5 minutes stirring regularly. You will soon start to smell a nice nutty fragrance. Toasting the seeds seems to give it a nice finished texture. 4- Turn off the machine and switch the setting to ‘MANUAL’ high pressure. Set for 1 minute. Even if you cook more than one cup quinoa, the setting will always be one minute. 6- Let pressure release for 15 minutes. 7- Fluff with a fork and serve. I like to make a double or triple batch so I can freeze some. To freeze, just place a couple cups of quinoa into quart freezer bags. Lay flat and freeze. These little bags of golden seeds will come in handy for future meals. Add it to recipes, hot breakfast cereals, salads and even your breakfast smoothie. What a great way to get some nutrition into any meal. Quinoa can be purchased at grocery store. Many stores now even offer it in the bulk section. There is a white, red or black variety. The darker grains have a nuttier flavor and slightly crunchier texture that make it great for salads and hearty soups. I like this brand. It is available here or at Costco. Sometimes I buy the mixed variety pack, which adds a little color to dishes and is a little more firm in soups.